Hey Personal Financial Freaks! This is my ninth Dividend Income Summary for 2016. As you can see on my Passive Income page, 12 companies chipped in for this month of September. I'm not a fan of fall -- especially with all the crap publicity surrounding the "back to school" propaganda. I say to this : chill out! What's the big deal? Holidays are over, we are all going back to work or to school. It's already depressing. Do we really need to be reminded as early as July? NO! After all, unless we chucked out all or clothes or pencils during summer, there's a frickin' good chance we are ready to go back to what we were doing a couple of weeks ago : that is going to work or school dressed and with some papers and pencils! I might also be a little misanthropist; that is why most people get on my nerves (not you!). Or is it because Mr. Market has been so frickin' high for so long... None of my stocks are cheap. Well, except for POW and PWF, but I have enough of both for now. And so I wait. and I wait... (so much for my dividend goal of 5 400$/year in 2016)...But eh, I'm piling up some cash that I will be able to deploy eventually. Check out my Fix Income Graphic here. 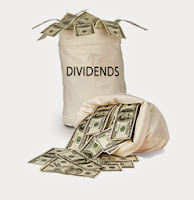 Anyway, back to my Dividend Income post...that's why you are here, no? What do you think of my dividend income stream? Do you like autumn (who cares really?)? And are you too planing on selling all of your assets on the Market?